A Night of Firsts | American University Washington D.C.
Former First Lady Laura Bush will speak at AU. 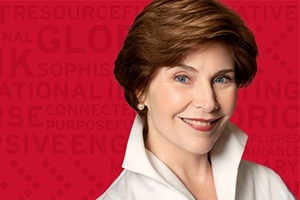 American University has made it official: The next Wonk of the Year award will be presented to former First Lady Laura Bush. She'll be the third person to receive this honor, joining former President Bill Clinton and CNN journalist Anderson Cooper. She will accept the award and deliver remarks at AU on Wednesday, April 8 in Bender Arena. The event is hosted by Kennedy Political Union, the student-run lecture series on campus. Since its founding in 1968, KPU has brought a number of leaders and dignitaries to AU. But it has never before hosted a current or former First Lady. KPU Director Tyler Bowders says Mrs. Bush was selected as Wonk of the Year because of her work to create meaningful change in the world. She's smart, passionate, focused, and engaged, and her record should resonate with the AU community, he says. "Mrs. Bush's global outreach in addressing issues such as literacy, women's education, and combating HIV/AIDS in Africa, and her domestic commitments to women's health, span before, during, and after her role as First Lady of the United States," Bowders says. "Like Clinton and Cooper, Mrs. Bush has been an eyewitness to major historical events in recent American history and has used her influence to enact both domestic and global change," he adds. Bush has championed education and literacy, co-founding the National Book Festival in Washington, D.C. She has a passion for international human rights issues, a mission she's continued to champion through the work of the George W. Bush Institute. Bush is currently Chair of the Women's Initiative at the Bush Institute in Dallas. In that role, Mrs. Bush oversees three signature programs: the Afghan Women's Project, which highlights the struggles and successes of Afghan women; the First Ladies Initiative, which supports First Ladies in Africa—and beyond—in their efforts to foster change; and the Women's Initiative Fellowship Program for rising female leaders in the Middle East and North Africa. Just recently, Rula Ghani, the First Lady of Afghanistan, visited Dallas and praised Mrs. Bush. "Once committed to a cause, she's relentless, she's resourceful, and she does it so gracefully, and so unobtrusively, that you don't realize her power until faced with her achievements," said Ghani, according to press reports. Anita McBride, an executive-in-residence at American University's School of Public Affairs, was Mrs. Bush's chief of staff in the White House from 2005-2009. McBride explains how AU, as an institution, devotes resources to examine the legacies of the nation's First Ladies. "It is fitting that we're recognizing one of the most active First Ladies in our history," she says. "And she has remained deeply invested, passionate, and committed to issues she was engaged in during public life." Laura Bush was born in Midland, Texas. She earned her bachelor's degree in education from Southern Methodist University and a master's degree in library science from the University of Texas at Austin. She's worked in public schools as both a teacher and a librarian. She married George W. Bush in 1977, and gave birth to twin daughters, Barbara and Jenna, in 1981. In April 2013, they welcomed granddaughter Mila Hager, daughter of Henry and Jenna Hager. McBride offers reasons why Bush was admired as First Lady. "Laura Bush is a very solid human being—very grounded," she says. "She never turned up the heated political rhetoric of the time. If anything, she helped to diffuse it by her calm demeanor." Her love of literature and books, McBride says, made her an effective communicator. "She has a beautiful way of using language. When she speaks, it means something," McBride states. McBride places her position in historical context, explaining the multi-faceted role of First Ladies in American democracy. "I think one way where First Ladies are unique in this is that they have an ability to rise above the political fray, and bring a human side to our politics. And really help remind Americans that our political leaders, no matter who they are, generally get into this because they want to do something good."